October saw the fourth Panasonic Aviation and Transport Innovation Summit (ATIS) and the event was undoubtedly another great success. 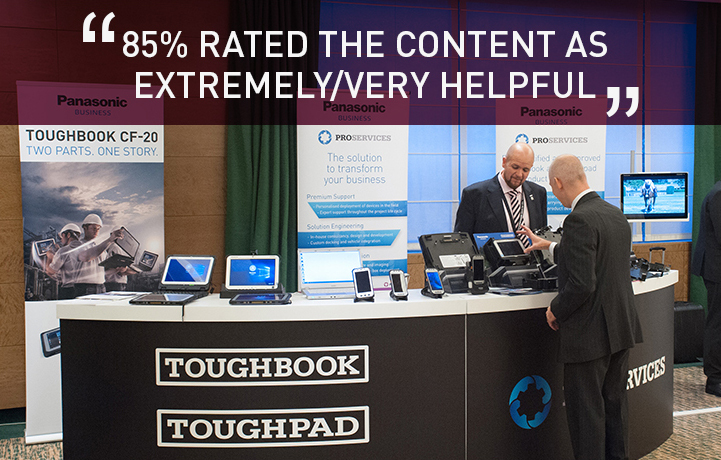 Exploring the latest advances in digital innovation, mobile computing and rugged technology for the railway and aviation sectors, ATIS 2016 proved highly popular, with no fewer than 86% of attendees rating the content as extremely helpful and 91% saying they were likely to attend again in 2017. 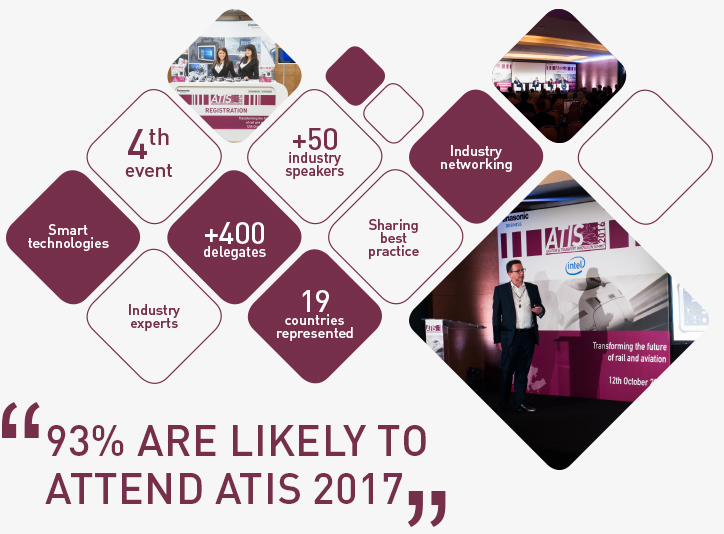 Discover who shared their expert insight and what was discussed at ATIS 2016. Read the opinion of international transport specialist Christian Wolmar, as he reports on the key topics covered at ATIS 2016. What has ATIS achieved in its first 4 years? and discussion at the event in our online video review. Technology is changing transport systems constantly. What no one had thought of 10 years ago is commonplace now. But there is no one to one relationship between a development perceived as key and the ultimate outcome a decade later. So we may be on the verge of a revolution that takes drivers out of trains and cars and pilots out of planes or that concept may be overhyped. Today's innovation may be the game changer or it might end up like the fax machine? Christian Wolmar, award winning transport author and TV pundit explores what makes a technological breakthrough. Connectivity is transforming the transport industry and helping it develop new business models based on cloud, mobility, social media, big data new innovation accelerating technologies and new computing devices. 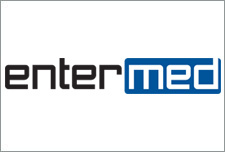 This presentation overviews the latest trends in the European transportation market. The transport industry has embraced Mobility and Cloud solutions in order to serve customers better, improve productivity and keep high security standards. Latest showcases and best practises will be shared from rollouts with airline and train companies, as same time we address latest global industry trends around mobility. Microsoft and our eco-system of solution partners strive to create seamless and personal experiences that drive consistency and brand value for our transportation industry customers. It has been 20 years since the birth of the first Toughbook, it this anniversary year we would like to share with the audience what is possible with a little bit of imagination and some engineering wizardry. John will use a couple of real life examples in transportation where a small amount of customisation has overcome technical challenges. 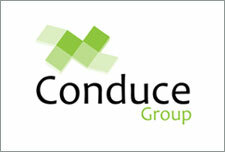 Using real world customer examples - from the people that make the planes and trains to the companies that run the rail and airline services day to day - this presentation will show how data and analytics can drive transformational change to the business and operating models within the rail and aviation industries. This workshop will outline the current technological and functional highlights of AMOS. In addition, Swiss AviationSoftware will be launching the AMOSmobile package for line and base maintenance. 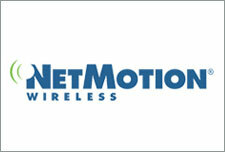 The demonstration will take a look at the core features of this product, as well as outline the AMOSmobile/EXEC vision. Typical IFE Systems are complex and their installation is time consuming and costly. In addition, an STC is required to certify the installation for airworthiness. 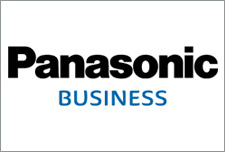 Based on the Panasonic Toughbook, Lufthansa Systems has created a battery driven Wifi-IFE solution that overcomes all these limitations involving complicated certification and time-consuming rollout processes. Live presentation: An introduction to the Conduce Windows 10 eTechLog8 application that fully replaces the paper based aircraft technical logbooks. A review of product functionality and a review of the National Airworthiness Requirements to be considered for the adoption of an electronic technical log within an airline to ensure a successful implementation and operational approval within the Airline. Case study - This session shows how SIME , the advanced maintenance system from RFI, collects and integrates with IN.Rete Maintenance all the applications used during the scheduling and execution of the maintenance operations managed by a mobile workforce through the Toughpad FZ-G1. Those applications include the work team management, the hourly basis allocation of the tasks and the survey during the visit on the lines. By means of a modular concept, you can now measure a multitude of objects (wheels, brake discs, rails, switches, etc.) 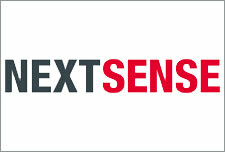 with one profile measurement device and analyze them according to your needs. The non-contact CALIPRI method, calculates all relevant wear parameters in the rail and trams and comfortably measures each aspect using only one device. This method not only extends service life but provides substantial cost reductions through its measuring accuracy. Explore the world of hands free computing (wearable technology) that looks at future applications and the benefits they bring for passengers, crew, mechanics, line workers and MRO technicians. 3D digital imaging could be the next step in accurately measuring production and products at the touch of a button. 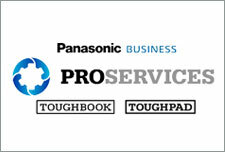 See how Panasonic can help you with these exciting technologies in an interactive workshop. Please familiarize with the event agenda, before arranging your travel. The transfer time to the venue without traffic is approximately from Fiumicino Airport 40 minutes by taxi while from Roma Termini Railway Station 40 minutes by taxi and approximately 30 minutes by underground plus 10 minutes by foot. For individual arrivals on October 11th, delegates are required to make their own way to the event venue. We recommend that your flight lands by 17.30 at the latest, to ensure you arrive in time for the dinner. Parking is available on site at the venue; please make sure to indicate it when registering. The closest underground stop – Cornelia stop - is just 10 minutes by foot.